Have you ever tried to paste a link to Facebook, only to find that the information doesn’t show up correctly? For example, maybe the title is wrong or the image doesn’t load. That’s where the Facebook Debugger (aka Facebook Open Graph Debugger or Facebook Link Debugger) comes in. By pasting your link into the Facebook Link Debugger, you can see the information that Facebook uses to share your link. And you can spot any errors or missing code. Here’s what you need to know about the Facebook Link Debugger, and how you can use it to boost your shares. Here’s where it gets interesting. Facebook Open Graph tags are special metadata tags that Facebook uses to pull the information it needs from your site. That means, if your link isn’t displaying the right content, Facebook Open Graph tags will help you fix the problem. Basically without Open Graph tags, Facebook has to guess which information to show. By placing Facebook Open Graph tags on your site, you can specifically tell Facebook what to display when you share a link. For example, you can add these tags to your articles to specify the URL, content type, title, description, and image. If your site is run on WordPress, you can also use the Facebook Open Graph plugin to make this process even easier. Shares are golden on Facebook—especially now. Facebook recently changed its algorithm to favor posts from friends and family over a post from publishers. As the result, publishers will need to rely more on Facebook users to be their amplification systems, since their own posts won’t hold as much clout. That’s why publishers need to prioritize the share. 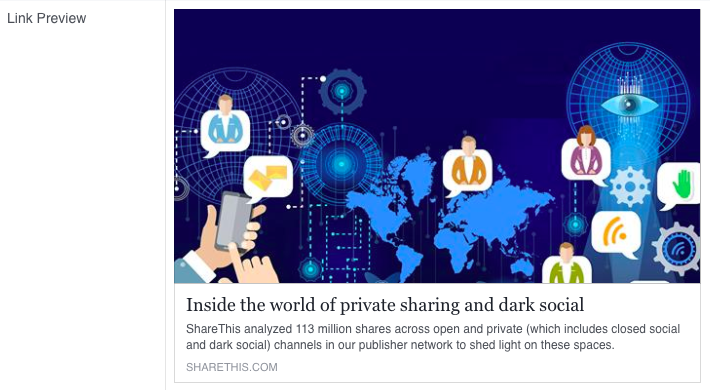 They need to empower readers to share articles by planting the Facebook share button on their sites. And they need to make sure that once readers do share to Facebook, the content is properly displayed. The Facebook Open Graph Debugger is key to making that happen.